Home » Wellness » Food » Chef Tony – A whole lot of poppin’ goin’ on! Chef Tony – A whole lot of poppin’ goin’ on! There are some types of food that we associate with certain activities. Hotdogs make people think of sports. Cake brings birthdays to mind. Cotton candy makes us all think of the carnival. But all will agree that popcorn and soda are meant to be eaten while watching a flick. Whether a movie or TV marathon … or just as pica-pica for a party POPCORN is definitely a hit! Last night, October 28, we had a popcorn party here at my place. SEVEN FLAVORS of Chef Tony’s popcorn were spread out on the table just waiting to be eaten. Choosing the flavor I liked the best was so hard! I just liked them all! For conservatives it is always good to go original. You can’t go wrong there. It’s your classic popcorn flavor without the mess! Those who are “watching their weight” will enjoy the light. It isn’t exactly guiltless ’cause it still has butter and sugar, but Chef Tony guarantees 50% less of both! I worried at first that it would contain artificial sweetener and I was relieved not to encounter the medicinal taste of Nutrasweet, Equal, or Splenda. Opening the tub of Cinnamon Butter was surreal. The distinctive smell of cinnamon just wafts into your nostrils, and in my case, made me think of cinnamon rolls and coffee. I thought it tasted good, too, but perhaps on the sweet side. I like it but I don’t think I can consume a small tub on my own. Pesto, pesto, pesto! Makes me think of pasta! To complete the pasta experience, though, I would recommend the addition of maybe pine nuts or more basil into the mix. Also, I think it could afford to be less sweet and more salty. Nonetheless, I CAN finish a whole (small) tub on my own. I know I have in the past, hehehe. When I heard that there was Parmesan flavor I admit that I was a bit apprehensive. I know that sounds weird, but … I just don’t like getting my hands dirty, hehe. I hate it when I buy cheese flavored popcorn and they pour on this powdered orange-colored cheese that just stains everything and is extremely messy. Dirty hands are a guarantee. 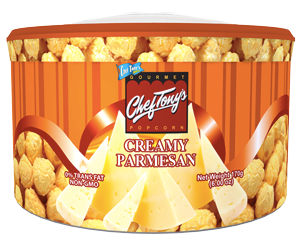 To my surprise, Chef Tony’s Parmesan flavored popcorn is nothing like that! In appearance it looks a lot like the ORIGINAL flavor. And then you open the tub and the smell of the PARMESAN hits you. Every bite is a harmony of cheese and butter! We loved this flavor so much that we almost consumed the contents of the tub in 5 minutes! This was while recording our comments, mind you. None of the other flavors went as fast! Hooray for parmesan! Now it is time for some nuts! We now open the tub of White Chocolate Walnut. I have to tell you right now … I’m not a fan of white chocolate, per se. I’m more of a dark chocolate kind of gal. But I do love chocolate and I do love walnuts, and the way the flavors blended was just perfect! 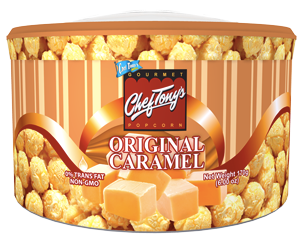 You still can’t get me to eat white chocolate in bar form but on Chef Tony’s popcorn, I will eat it by the handful. The sweetness of the chocolate and the bitterness of the walnuts made an interesting contrast. I think this flavor is perfect to give as a gift. We are down to the last flavor for the day … Roasted Almond Mochachino. To say I was excited about this one is an understatement. From the name itself I knew to expect something fun! Think about it, coffee flavored popcorn … with whole almonds! How can you go wrong? I tried eating this flavor today while enjoying a cup of coffee and it was perfect! 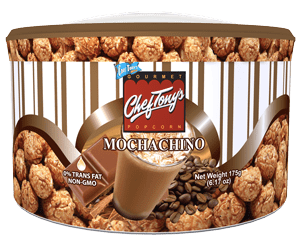 Roasted Almond Mochachino is the perfect blend of coffee, chocolate, popcorn, and fresh almonds. Coffee lovers everywhere will definitely enjoy this flavor. Some people say that the best food critics are kids. It isn’t true that they will eat anything. As a matter of fact, they are quite obvious when they hate something! There were 4 kids sampling the popcorn with us, and the youngest of the bunch was my nephew Gene. At a year and a half, he knows EXACTLY what he wants! He tried all the flavors, and did not turn any away!!! As a matter of fact he came back for seconds and thirds! Actually, he DEMANDED for seconds and thirds, hehe. I’d say he ate about as much as a small tub full of popcorn. The labels are a mite confusing, and the color combinations don’t always work. The original design is good, though. But the background has a tendency to make me cross-eyed, especially the green and red combination. The containers are top-notch! Most people don’t notice this but … his containers are marked 5 on the recyclable scale. This is good! If your plastic containers are marked 5 to 7 then that is definitely recyclable. Most plastic containers of foodstuff nowadays are rated a 1or a 3 and those are ideally just for one use. 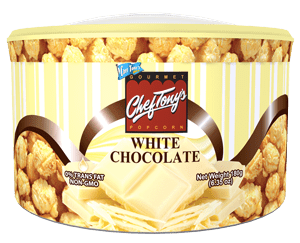 This makes buying Chef Tony’s popcorns not only a delicious decision but a practical one as well! We noticed, also, that the containers are “child-proof”. This is a good thing because it means that the container is airtight and will keep the contents fresh longer. Oh, and it means the kids can’t sneak a bite without our knowledge, hehehe. Is there an easier way to open it? 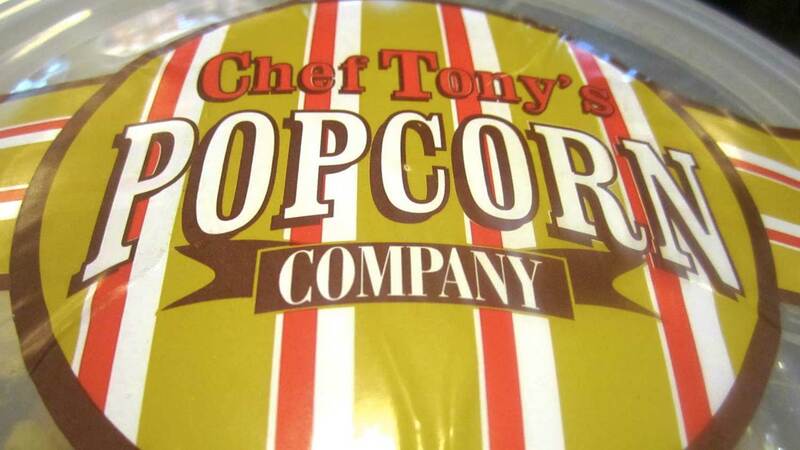 Chef Tony’s popcorn is gourmet at an affordable price! It is the perfect date snack, the perfect viewing companion, and the perfect gift! If you haven’t tasted it yet, I promise you, you are missing out! Chef Tony’s has 2 more flavors we didn’t get to taste: Macadamia Swirl and Caramel Pecan. Based on the seven above, these 2 are bound to be great! I can’t wait to taste them, too! Watch out for the Christmas flavors coming soon. You can find Chef Tony’s outlets at Tomas Morato (Quezon City across the street from McDonald’s), Metrowalk (Ortigas Center near Pancake House), and Mega Mall Building A (near National Bookstore. For inquiries you may call them at 0917-500-CORN. Did we have fun? Was the popcorn good? ABSOLUTELY! I can honestly say, I haven’t tasted anything better! Kudos, Anthony!